LOOK: Are you pictured in our bumper fans gallery from Meadow Lane? 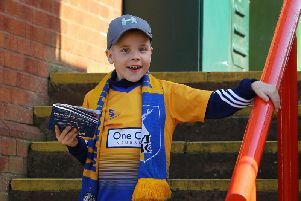 LOOK: Are you in our bumper Mansfield Town fans gallery? More than 4,100 Mansfield fans packed into Meadow Lane to see another dramatic derby day. Stags rescued a point thanks to Kane Hemmings’ 98th minute penalty to send the away end wild. Take a look at our fans’ gallery and see if you can spot anyone familiar. How did Mansfield Town players rate?